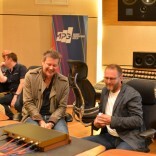 ‘Continuing with the tremendous success of the MPG ‘Under The Hood’ technical events, the second in the series was again held at the renowned British Grove Studios on Thursday 23rd June, 2016. As the name suggests, ‘Under The Hood’, is aimed at going beyond the manufacturers demonstration of (and possibly intention for) a given piece of equipment. The event always has an extremely limited number of places and once again reached capacity in a very short time period after being announced. 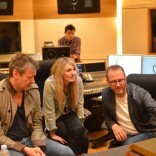 It was MPG Full Members Alan Moulder, Danton Supple and Breakthrough Producer Of The Year, Catherine Marks, who had the chance to put Kush Audio through it’s paces this time around. As with the first of these events, producer and MPG Executive Director, Andrew Hunt, compered. Far from a product demo the nature of these events is to see exactly how each panellist would prefer to test the equipment at their disposal. Kush Audio, the brain-child of Gregory Scott, is a New York based manufacturer of both hardware and software products. This time on the ramp for inspection, two pieces of hardware were chosen; the Clariphonic and the Tweaker. The Kush Audio Tweaker is described as a single-channel VCA dynamics processor. As it happened, the panel would soon realise that this description doesn’t come close to conveying the versatile and playful creativity this product can achieve. 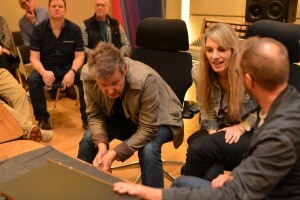 Catherine had arrived with a Pro Tools session and chose to kick off with trying the unit on drums. The expressions that came instantly from our panellists included “fat”, “really nice crunchy compression”, “really good on the cymbals”, “super fast attack”, “great combination of drive and compression”. We’d returned the signal path to it’s own channel on the desk (an API desk in studio 2 at British Grove), so we could hear exactly what the unit was doing in isolation if we wanted to. 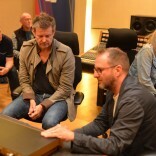 The unit crunched the drums in an extremely pleasing way and the unit’s ‘mix’ control makes it extremely easy to attain the right balance of source sound and processed sound. It was fairly clear that this unit was exciting, fun, versatile and easy to use. The negative comments at this point were that, for one, it would have been nice to have a second unit. As the unit is mono, we weren’t able to process the stereo signal. It was suggested that a stereo unit would be good but this was quashed as being able to link to mono units and process left and right individually should you need to is a more popular choice. The second criticism at this point was the choice of colour scheme and small legending made the unit difficult to read. 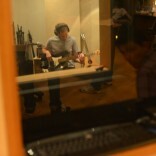 The unit has a side chain, so the next step was to use the unit on bass side-chained to the drums. In Catherine’s words this produced very cool results. The Tweaker has the ability to add an aggressive crunch through to squashing the signal to such an extent that it has an extremely creative influence on the part played. On vocals we found it to be aggressive, yet smooth and again, the ‘mix’ pot allowed just the right blend for whatever you’re after. It was felt the time was right to move on to the Kush Audio Clariphonic, which claims to have a “silky top end”, it didn’t fail to deliver. Designed to be less reliant on numbers and more on your ears the Clariphonic isn’t simply another EQ. It uses ‘shelving’ and ‘tilting’ to achieve the desired results. It’s not a particularly subtle unit but the panellists were in complete agreement that the results were both extremely pleasing and musical. A downside to the unit is that it doesn’t have a true bypass. The signal still runs through the circuit in bypass and definitely ‘does something’ even in this state. 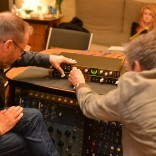 Alan Moulder likes to work from “where he is” on a mix and found this lack of true bypass a real hindrance to his work flow, “it’s impossible to easily hear exactly what [the unit] is doing.”. 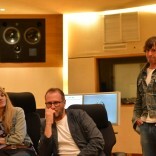 We decided to move away from the Pro Tools session but The Tweaker was just too much fun to leave alone. Not wanting to neglect the Clariphonic either, it was decided to experiment using the Tweaker on an acoustic guitar with the Clariphonic on the side chain, creating a single band dynamic processor. 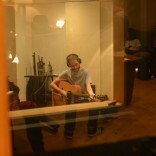 A big thanks to musician Scott Nelson, who we’d arranged to be on hand with an acoustic guitar. Danton was straight in, pointing out how used in this way, the two units were able to add really nice harmonics to the acoustic by adding drive on the Tweaker and by manipulating the Clariphonic give a world of options in where those harmonics were added. This lead the panel on to wanting to try the units nice again on bass, so with a change of set up, Scott once again obliged. The Tweaker here demonstrated it’s more subtle qualities, yes it’s creative, yes it’s fun, yes it can really “do stuff” but used in a more subtle way to add a little drive and compression to the bass it gave a real ‘wow’ factor. Catherine said it was “like a time machine”, instantly giving an ‘old sound’ to the bass. Danton commented on how “creamy” it had become in the lower mids and Andrew Hunt adding that it managed to do this and still add a little punch and definition. 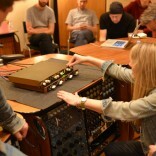 Kush audio was born from Gregory Scott modifying Empirical Labs Distressors and with the units retailing for similar prices, it was only natural that some kind of comparison was discussed at some point in the evening. The conclusion – they do different things well in different ways – and the panellists all wanted both!! For the first time we streamed parts of the event on social media, with tremendous success! But as with the last event in this series, the details and intricacies of the entire event are far too vast to try to include in any singular write up, it’s one of those situations where you really did ‘have to be there’. 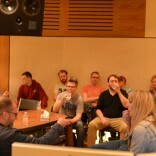 We’d like to take this opportunity to thank British Grove Studios once again for their generous hospitality and staff, Catherine Marks, Danton Supple, Alan Moulder, Kush Audio, Paul Levigne at KMR, Andrew Hunt, Lauren Deakin-Davies, Charlie Slee, Scott Nelson and those MPG Full Members who were lucky enough to get a ticket.